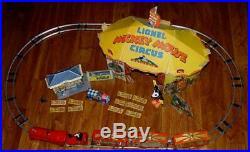 DISNEY 1935 “LIONEL #1536 MICKEY MOUSE CIRCUS TRAIN”COMPLETE HIGH GRADE SET-RARE. RARE HIGH GRADE COMPLETE SET NUMBER 1536. 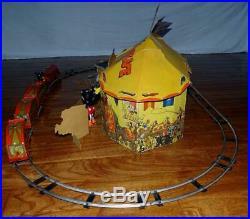 DISNEY 1935 “LIONEL MICKEY MOUSE CIRCUS TRAIN” ORIGINAL TRAIN SET ALONG WITH TRACK, BOX, TENT AND WAVING MICKEY BARKER(NEAR MINT CONDITION) AND MUCH MORE. THIS EXTREMELY RARE COMPLETE SET IS ONE OF THE MOST AGGRESSIVELY SOUGHT-AFTER VINTAGE TOYS BY DISNEYANA COLLECTORS. WHAT MAKES THE SET EVEN MORE SCARCE IS THE INTEREST IN THE SET BY 1930s TOY TRAIN COLLECTORS AND GENERAL TOY COLLECTORS ALIKE. 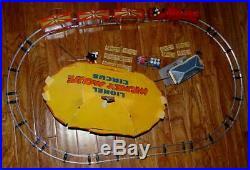 THE 5 PIECE TRAIN SET IS IN OVERALL EXCELLENT PLUS CONDITION. THREE BEAUTIFULLY LITHOGRAPHED METAL CARS ARE JOINED WITH THE STOKER(COAL CAR) WITH A MECHANICAL “SHOVELING” MICKEY. AS THE TRAIN IS MOVING ALONG ON THE TRACK, THE HAND PAINTED COMPOSITION “MICKEY THE STOKER” ACTUALLY MOVES UP-AND-DOWN TO ACTUALLY APPEAR AS SHOVELING COAL. THE CARS ARE PULLED AROUND THE TRACK BY A VERY POPULAR RED “0” GAUGE LIONEL COMMODORE VANDERBILT LOCOMOTIVE. THE ENGINE HAS A WIND-UP CLOCKWORK MECHANISM WITH DETACHABLE KEY. I HAD THE LOCOMOTIVE DETAIL SERVICED BY ONE OF ONLY A HANDFUL OF PEOPLE THAT CAN WORK WITH THESE VERY SPECIAL LOCOMOTIVES. THE CLOCKWORK MECHANISM AND ENGINE ARE IN EXCELLENT WORKING CONDITION. SPECIAL NOTE: ORIGINALLY, THE ENGINE LIGHT COULD BE ACTIVATED BY AN ON/OFF LEVER SWITCH IN THE REAR CAVITY OF THE ENGINE, BUT IS NOT CURRENTLY FUNCTIONING. ABOUT 4 YEARS AGO, I DID SOME EXTENSIVE RESEARCH AND WAS NOT ABLE TO FIND ANY AVAILABLE AS A REPRODUCTION BATTERY. I HAVE CONFIRMED MY FINDINGS WITH LEADING VINTAGE TRAIN RESTORATION COMPANIES AND INDIVIDUAL EXPERTS AND THEY ALL CAME UP WITH THE SAME RESULTS THAT I HAVE. THE METAL KEY IS INCLUDED. WHAT MAKES THE TRAIN SET EVEN MORE DESIRABLE ARE THE “EXTRAS” THAT CAME ALONG WITH THE TRAIN SET. A SERIES OF LITHOGRAPHED CARDBOARD PUNCH-OUTS WHICH CAN BE ASSEMBLED AND DISPLAYED INSIDE AND OUTSIDE OF THE LARGE TENT. ALL OF THE ORIGINAL PIECES ARE STILL WITH THIS SET. EACH OF THE PIECES HAVE BEEN ASSEMBLED FOR THIS SET AND IN MY MANY PHOTO REFERENCES. ALL OF THESE PAPER ACCESSORIES HAVE VERY BRIGHT AND VIVID EARLY MICKEY, MINNIE, HORACE HORSECOLLAR AND CLARABELLE COW LITHOGRAPHED GRAPHICS. THE RARE HANGING FLYING TRAPEZE LITHOGRAPHED AND DIE CUT PIECE IS DISPLAYED IN MY PHOTO REFERENCES AND IN EXCELLENT CONDITION(THIS PIECE IS ALMOST ALWAYS MISSING FROM MOST SETS THAT COME AVAILABLE). THE VERY LARGE AND IMPRESSIVE CIRCUS TENT MEASURES APPROXIMATELY 8″ X 18″ X 15 TALL AFTER ASSEMBLED. STANDING IN FRONT OF THE TENT ENTRANCE IS A COMPOSITION WOOD HAND PAINTED AND WAIVING MICKEY MOUSE THE “BARKER”. A SUPER RARE BI-FOLDED ORIGINAL 1935 LIONEL TRAIN PROMOTIONAL PAMPHLET WAS PART OF THIS ORIGINAL SET AND HAS SOME WONDERFUL INFORMATION AND GRAPHICS FOR NOT ONLY THE CIRCUS TRAIN, BUT HANDCARS AND MUCH MORE. I DID NOT PROVIDE A PHOTO REFERENCE OF THE UNFOLDED INSIDE PRINT, BUT IT IS AWESOME. I WANTED TO INCLUDE THE REFERENCE, BUT I HAD HIT MY LIMIT OF 24 PHOTOS THAT I COULD PUT IN THE LISTING. THE CONDITION IS OVERALL VERY GOOD. A, LIKE-NEW, SET OF 12 TRACK SECTIONS IN THE ORIGINAL 2 RAIL FORMAT THAT IS LARGE ENOUGH TO SURROUND THE ENTIRE SET AS SHOWN IN SOME OF MY PHOTO REFERENCES. THIS TRACK HAS SOME GREAT VALUE JUST ON IT’S OWN. THE ORIGINAL 11 1/4″ X 17″ X 2 1/4 DEEP 2 PIECE BOX WITH INSERTS IS IN OVERALL VERY GOOD CONDITION WITH A VARIETY OF COSMETIC AND/OR CONSTRUCTION DISTRACTIONS. DUE TO THE BOXES LARGE SIZE, IT IS USUALLY BEAT-UP PRETTY BAD FROM DECADES OF USE. THE VERY COLORFUL GRAPHICS APPLIED TO THIS BOX ARE FANTASTIC. THE LITHOGRAPHERS HAD TO LAY DOWN ALLOT OF INK TO CREATE THE COMPLEX SCENE THAT COVERS THE CARDBOARD BASE. I HAVE PROVIDED A COUPLE OF PHOTO REFERENCES OF A WONDERFUL NEW BOOK THAT WAS RELEASED LAST YEAR FOR SALE. THE BOOKS COVER SHOWS MOST ALL OF THE ORIGINAL SET PARTS. THIS 118 PAGE BOOK IS AS GOOD AS IT GETS FOR THE SPECIFIC FOCUS THAT WAS ITS MISSION. HATS OFF TO Mr. CLAUS FOR ALL THE TIME AND DETAILED EFFORTS THAT IT MUST HAVE TAKEN TO PROVIDE SUCH PICTORIAL REFERENCES AND INFORMATION COMPILED FOR THE BOOK. I HOPE THIS RECOMMENDATION HELPS HIS BOOK SALES! PLEASE VIEW MY MANY ENCLOSED PHOTO REFERENCES FOR THE BEST TOOL TO USE IN DETERMINING THE QUALITY OF EACH OF THE PIECES THAT MAKE UP THE VERY SPECIAL VINTAGE TRAIN SET FOR YOURSELF. A PICTURE IS STILL WORTH A THOUSAND WORDS………….. THIS DESCRIPTION, PHOTOS AND SLOGANS ARE COPYRIGHTED BY BRIANCOLLECTIONS4U. NONE OF THESE MENTIONED ITEMS MAY BE USED WITHOUT THE EXPRESS PERMISSION FROM BRIANCOLLECTIONS4U. Get Supersized Images & Free Image Hosting. Create your brand with Auctiva’s. Attention Sellers – Get Templates Image Hosting, Scheduling at Auctiva. Track Page Views With. Auctiva’s FREE Counter. 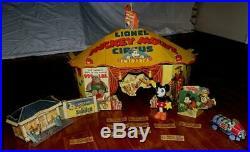 The item “DISNEY 1935 LIONEL #1536 MICKEY MOUSE CIRCUS TRAINCOMPLETE HIGH GRADE SET-RARE” is in sale since Friday, February 8, 2019. This item is in the category “Collectibles\Disneyana\Vintage (Pre-1968)\Other Vintage Disneyana”. The seller is “briancollections4u” and is located in Woodbridge, California. This item can be shipped worldwide. 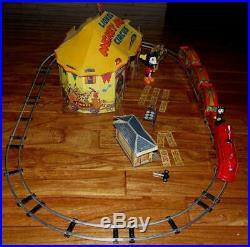 This entry was posted in disney and tagged circus, disney, grade, high, lionel, mickey, mouse, set-rare, traincomplete. Bookmark the permalink.